Arguing with Tradition is the first book to explore language and interaction within a contemporary Native American legal system. Grounded in Justin Richland’s extensive field research on the Hopi Indian Nation of northeastern Arizona—on whose appellate court he now serves as Justice Pro Tempore—this innovative work explains how Hopi notions of tradition and culture shape and are shaped by the processes of Hopi jurisprudence. Like many indigenous legal institutions across North America, the Hopi Tribal Court was created in the image of Anglo-American-style law. But Richland shows that in recent years, Hopi jurists and litigants have called for their courts to develop a jurisprudence that better reflects Hopi culture and traditions. 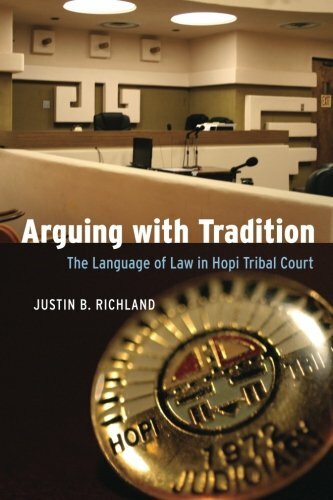 Providing unprecedented insights into the Hopi and English courtroom interactions through which this conflict plays out, Richland argues that tensions between the language of Anglo-style law and Hopi tradition both drive Hopi jurisprudence and make it unique. Ultimately, Richland’s analyses of the language of Hopi law offer a fresh approach to the cultural politics that influence indigenous legal and governmental practices worldwide. View More In Rules & Procedures. If you have any questions about this product by University of Chicago Press, contact us by completing and submitting the form below. If you are looking for a specif part number, please include it with your message.